Big thank you to Grand Central Publishing for our copies in return for our honest reviews. When Louise Williams receives a message from someone left long in the past, her heart nearly stops. Louise meets the new girl in school, Maria, and they instantly hit it off. But the popular girls in school have heard rumors about Maria and want to ostracize her and Louise decides to follow suit. In this day and age, it's no surprise that more and more books are coming out about social media and it's every day occurrence of our lives. In our inability to unplug, we leave ourselves vulnerable to vultures who know where we are, what we're eating, who we're dating and otherwise promoting our so called perfect lives. But this transparency has both positive and negative impacts on our lives. 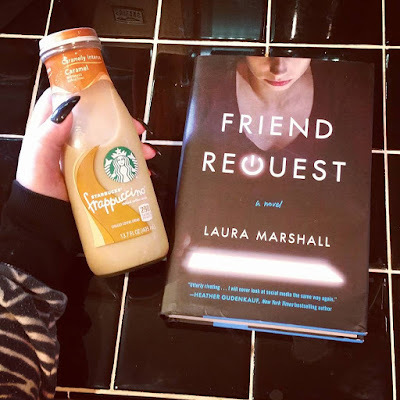 I really thought this book would be more into the social media aspect, but really it was more about a high school incident that Louise just canNOT get over. Louise is a people pleasure - nice enough but wants to be involved in the popular group in school. I think any of us in our teenage years can empathize with this feeling. What's annoying is that 27 years later, she's in her 40s and hasn't changed a single bit! She's basically still the Veronica in a sea of Heathers but doesn't seem to learn. The book did seem to drag in certain areas but I did feel the ending was decent. I think I would've liked it more if I hadn't lost some interest in the middle. By the time I got there, I just didn't care who in this cast of selfish idiots did it. I wanted to love this, I really did but unfortunately over all it didn't work for me. I think it fits better for those who like a slower paced high school mystery that touches on social media and bullying. I'm instantly intrigued by thrillers and suspense novels that have modern technology or social media involved. It's such a present thing in our lives and we never truly know who is on the other end of that profile. So when I read the synopsis for Laura Marshall's debut, FRIEND REQUEST, I was very excited to start. Present day, 2016, Louise is a newly divorced mother who is trying to live the best life for her son. 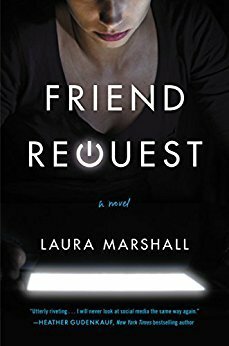 One day, she receives an email that makes her heart stop - a friend request on Facebook from Maria Weston. There's only one problem, Maria Weston couldn't possibly have sent that request, because she's been dead for 25 years. Past, 1989, Louise befriends the new girl, Maria, that transferred very late into her senior year. She's drawn to her because she's completely unlike her other friends. They become fast friends, but then one fateful night changed everything. We got back and forth from 1989 to 2016. Trying to learn what happened 25 years ago to Maria. Who is really behind the Facebook page and why are they now contacting Louise? So many questions to be answered and that kept me flipping the pages. Having to reconnect with friends she severed ties with just to piece together the events of that night. We see everything through the eyes of Louise and in these kinds of suspense novels we have to wonder, is she a reliable narrator? With a red herring or two thrown into the mix, this makes for a compelling read. I will say that the ending wasn't my favorite, but it tied things together for the readers. Overall, I did enjoy this book and it's a solid debut! The elements of social media were great and the story wasn't predictable. If you like alternating timelines and a potentially unreliable, solo narrator, then this is the suspense novel for you!